When copying with the Finder, new files will be created with read + write permissions for the current user. These files will not be readable by other users. 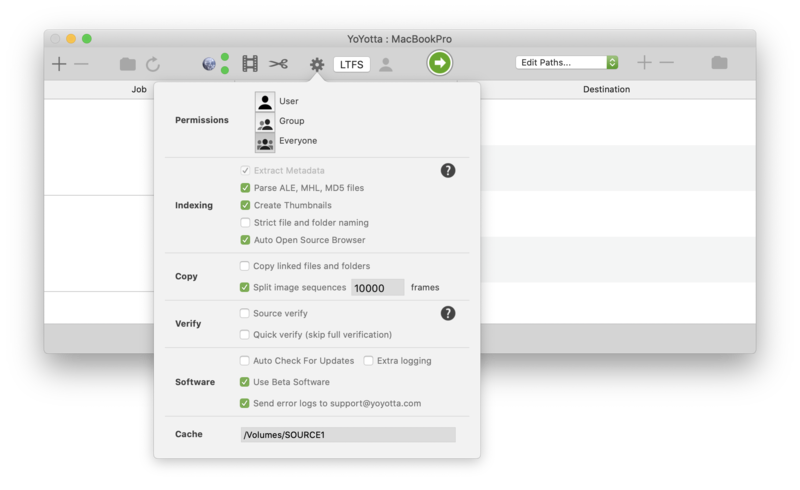 When copying with YoYotta you can choose User, but it may be easier to choose Group or Everyone. Group or Everyone will allow other users to read, write and delete the new files. This only applies to new files created by YoYotta. Files on the source must be readable and YoYotta will warn if the permissions for any source files are preventing access. Use the Finder to change permissions, then reindex the source by clicking the refresh button above the Job table. Extract Metadata When indexing a job extract metadata like timecode, duration and codec for video assets. This will be ignored for LTFS tapes as it will take too long. Create Thumbnails When indexing a job create thumbnails for video assets. This will be ignored for LTFS tapes as it will take too long. Strict file and folder naming When archiving camera footage we suggest using only these characters: [ a-z ], [ A-Z ], [ 0-9 ], [ . ], [ _ ], [ - ] in file and folder names. This is a requirement for studio uploads. When turned On YoYotta will be strict and warn about other characters. Rename the files or folders and then reindex the job. This setting will be too strict for jobs with other files and documents. So no spaces in file name or paths. When turned Off you can use almost any characters. There are still some that are illegal for cross platform use. This will be ignored for LTFS tapes as it will take too long. Auto Open Source Browser Open source browser automatically when adding a new source. Links are a way for applications like FCPX to reference files that are in another place on your storage. When a source with links is indexed LNK will be shown in the file type table. If there are linked files in the source then normally YoYotta will create the same links on the destination. So the material will not be part of the archive. Then when the archive is restored the links will point back to the original material, assuming it is still there. Turn on Copy linked files and folders to copy the linked files. After turning this on refresh the source and YoYotta will reindex and the size of the source will increase. The archive will then be self contained and can be restored without needing the linked material. Aliases are similar to links, but they are unique to the Finder. So YoYotta does not copy them. Aliases will not work on other operating systems or LTFS. Images sequences consist of sequentially numbered frames like DPX or EXR. When copying a folder with a sequence YoYotta will not split up the sequence. So if a destination does not have enough space then YoYotta will copy the entire sequence to the next tape or drive listed as a destination. If the sequence is large, like 90 minutes of 4K DPX this may be more than will fit on a drive or tape. To allow this to be archived set a number of frames (for example 10000) and turn on Split image sequences. Now YoYotta will try to fit as many 10,000 frame parts, moving on when the destination is full. The minimum is 5000 frames. If you have already indexed a source then after turning this on or changing the number of frames click the refresh above the Job table. Note that this does not change the folder structure on the destination. This is a double check of the source files read about it here. Normally YoYotta reads back all files to verify them. You should let this complete before erasing the camera card, deleting the source material or returning the drive. Turning Quick Verify on will disable this full verify. YoYotta always calculates MD5 and xxHash checksums regardless of this setting. Turn Quick Verify on when restoring to skip the full verify. Quick Verify cannot be used when spanning tapes. Read about release and beta software versions here. Read about error logs here. By default YoYotta will store image thumbnails in a YoYottaCache folder in Documents. If required they can be stored on another volume.